Ten years ago I packed up my life and headed back to my childhood home of Wagga to figure out what to do next. Having both my Mum and Nana in town – and a lot of time on my hands – meant many hours could be spent crafting in company. Eventually Mum and I decided to have a regular meeting time every week to get together and each work on our latest project. One week at her place, the next week at mine. 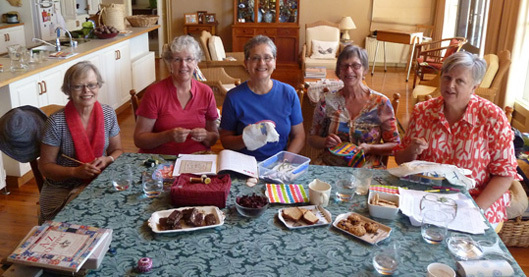 One by one, Mum’s friends joined in and we’d share a cuppa or two, a homemade sweet treat, plenty of laughs, and of course, a bit of stitching or knitting. 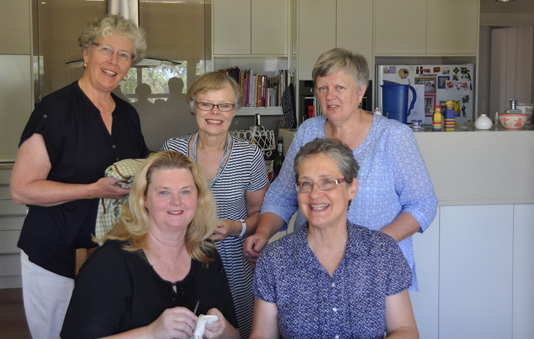 While I moved on to Sydney the following year, and these days take my craft where I can find it, I’m happy to say the stitching ladies – as they’re affectionately known – still meet every week. Left to right: Gillian, Meri, Pat, Di and Susan. These women are extremely talented and have done some amazing work over the years – I’ve posted some of Mum’s projects before and hopefully I can persuade the others to share as I expand this blog a bit. They’ve made quilts, cushions, Christmas stockings, jumpers, cardigans, cross-stitch and embroidery samplers, smocked baby dresses, jewellery, bags, hats and a whole lot more besides; they’ve celebrated births, marriages and significant birthdays and marked the occasions with a crafted keepsake; and they’ve been there for each other through major illness or the loss of a love one with cooking rosters and kindness. So this post is dedicated to the stitching ladies – congratulations on ten years and here’s to many more! Back row (L to R): Meri, Gillian and Susan. Front row (L to R): Marilyn and Pat. Thanks Tara. You've made us feel very special. Well you all are pretty special!